Bottombracket: WHY ARE YOU DOING THIS? 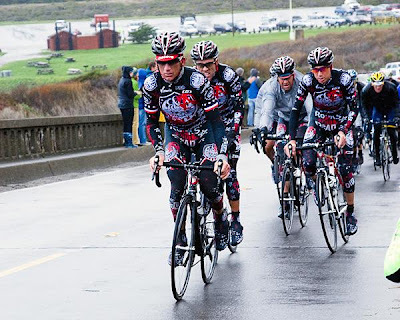 Tyler Hamilton, riding in the cold and sopping wet Tour of California yesterday, along with two of his boys at Rock Racing who are apparently too tough to wear gloves or rain jackets unlike everyone else. Well, they were defending the leader's jersey. And they are Rock Racing. We are deep in the depths of a not very bad winter here in southern Ontario; the sun has been shining for whole days. Temperatures have been hovering around the O degrees Celsius mark in the last days, and I have been totally uninterested in racing a bike for months now. As in, no training of any kind and disgusted at even the thought of participation in a road race. Until Sunday. We had one of these one degree and blazing bright days that screamed for a bike ride of one kind or another - even A. felt the urge and that guy can sit in front of his computer in the dark of his bedroom under any circumstances. We rolled out as three, with our wise old Yoda of the bicycle, the one and only D. D. took one look at me with my bib knickers and race-ish white road bike, and said "That's serious, man". What did he mean? "I've got double overbooties on" was my only reply. Of course, D., who's been an amateur road racer, pro mechanic, bike messenger, and model train engineer in his days, was running a single speed winter bike with at least 28mm tires and full fenders, as well as foul weather cycling pants. As in pants, not tights. D. has let go of all pretenses to speed and raciness. I, on the other hand, have not. And this sub-two hour roll through the flat, straight streets of a peopleless South Etobicoke confirmed it. Not having done a group ride since early September, I kept finding myself off the front of this mellow, first of the year outing with my two non-racer companions, itching for more. Yesterday I pulled the trainer out and put my bike in it for the first time since I was racing 'cross in the Fall. It felt good. There, I said it. I enjoyed riding on a stationary bicycle in my living room. The downpour of sweat, my heart rate monitor still not working, my old bike shorts now hideously stretched and deformed, none of it dampened my enthusiasm, not even the 8-speed wheel I had stuck into the rear of my 10-speed setup could bother me. I made a horrible racket for a solid hour and climbed off, feeling good. I'll certainly digg it and personally suggest to my friends. I'm sure they'll be benefited from this site. Hey very cool blog!! Guy .. Beautiful .. Superb .
) I maintain such info much. I was looking for this certain information for a very long time. It's amazing to pay a visit this web page and reading the views of all mates on the topic of this article, while I am also zealous of getting familiarity.